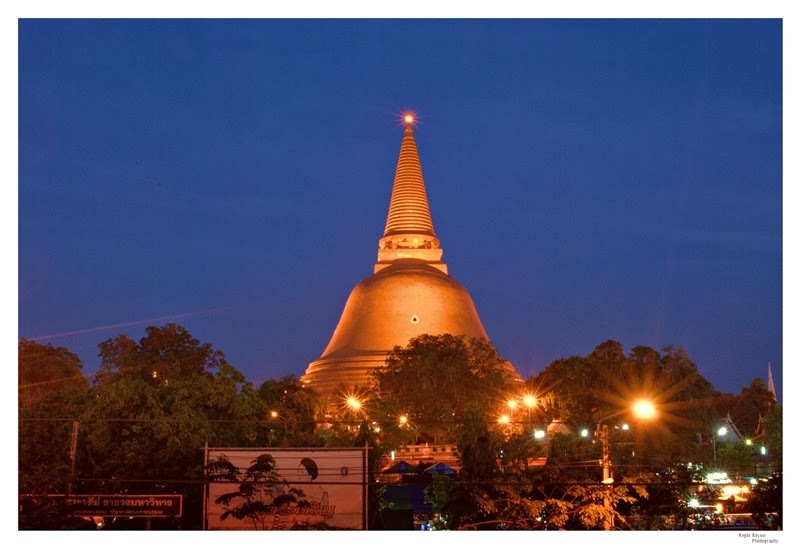 In Nakhon Pathom, you can find the tallest stupa in the world. At 127 meters, Phra Pathom Chedi is the tallest stupa in the world. Its height towers the city of Nakhon Pathom, about 45 minutes by van from Bangkok. Stupa or Chedi is a mound-like or dome-shape, hemispherical structure which houses Buddhist relics. Famous stupas in the world include the Shwedagon pagoda in Rangoon and the Sanchi in India. These religious infrastructures are considered important structures in Buddhism. I was able to visit the Phra Pathom Chedi a lot of times. This towering yellow-orange stupa is a beauty to behold and as usual-amazes me each time I ponder how in the world did they made it. Remember, it was built in the 19th century, when there were no modern tools yet. I was also fortunate to visit the Shwedagon pagoda in Burma and always thought that it is tall-well it really is tall-but here I am, was able to witness a taller stupa. Shwedagon’s stands at 99 meters while Phra Pathom’s height is 127 meters. In my travels, it’s always a fulfilling thing to be able to visit the superlatives of this world-the tallest, biggest, smallest, most beautiful, grandest, etc. So being able to visit this stupa is really a wonderful feeling. Aside from its stature, this stupa is very important in Thai Buddhism, in fact, it’s one of the most important Buddhist infrastructures in Thailand, as it contains relics of Buddha. Even Kings of Thailand visit this for religious purposes. One king, King Vajiravudh (Rama VI) even built a palace nearby for him to have an abode every time he visits this stupa. In my visits, I notice locals worshipping, offering something to the Buddha statue, pasting gold leaf to the smaller Buddha statues, or simply taking photos. There are also some tourists visiting it, although not much. Most of them are from group tours with their tour buses. In some nights during the week, they setup a night market in its compound where you can enjoy lots of different Thai food. It’s a good place to relax and eat while beholding the glowing stupa at night. There are also cozy restaurants nearby which are located on the 2nd and 3rd floor of a building and has an outdoor patio designed to be able to have a wonderful view of the stupa while dining. Those are great places to dine. Visit Nakhon Pathom and be able to witness the tallest stupa in the world and one of the most important Buddhist infrastructures in Thailand. -Take a van from from Victory Monument in Bangkok. The terminal is located just beside Century Mall below the BTS (skytrain) station. -Travel time is 45 min. to 1 hour. -Inform the driver that you’re heading to Phra Pathom Chedi. -There are also motorcycle taxis in the city. -In going back to Bangkok, the van terminal is located just beside Phra Pathom Chedi. There are also budget hotels near that area. Rong rem is the Thai word for hotel.